Stab/JG1- Emblem of the Stabsschwarm of Oberstleutnant Carl Schumacher. The eagle looks over the Heligoland. 1939- 1940. Bf109E. 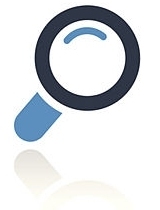 JG 1 - Derived from the Schumacher Emblem, eagle launched from a bow. 1940 -1943. Bf109G. 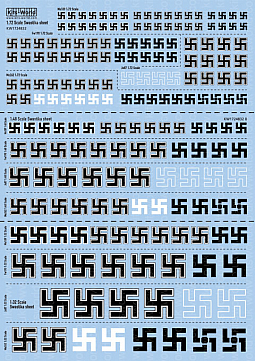 JG 1 'Oesau' - New Geschwader emblem introduced by Walter Oesau in September 1943. 1943 - 1945. 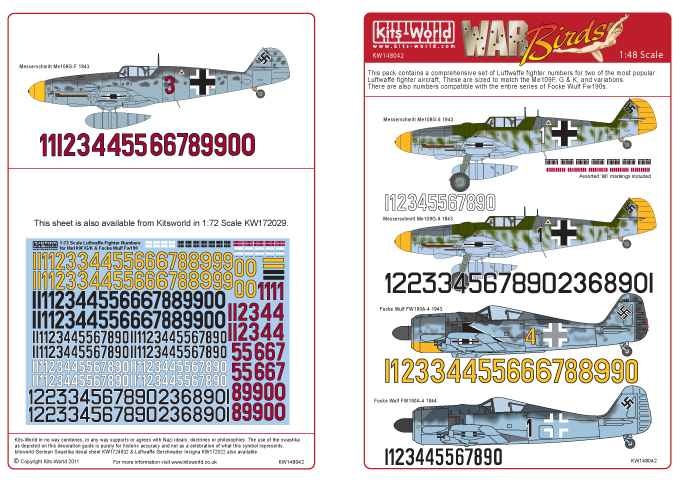 Bf109G, Fw190A. 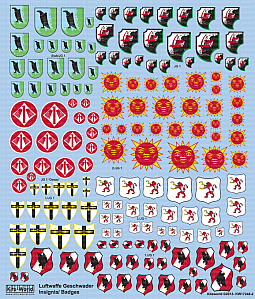 I./JG 1 - The 'Crusaders Cross of Jesau' based on the emblem of the town in East Prussia. 1940. Fw190A. I.JG 1 (later) - Emblem originated from JG 77 and was used on the He162. 1945. 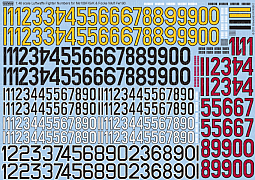 2./JG 1 - Based on the trademark of the Sun insurance company, it was used in many subtle versions and usually appeared alongside the name of the pilot's wife or sweetheart ! 1941. Bf109E. 3./JG 1 - A lion rampant holding a number '3' it was introduced in late 1944, and was only seen on one He162. 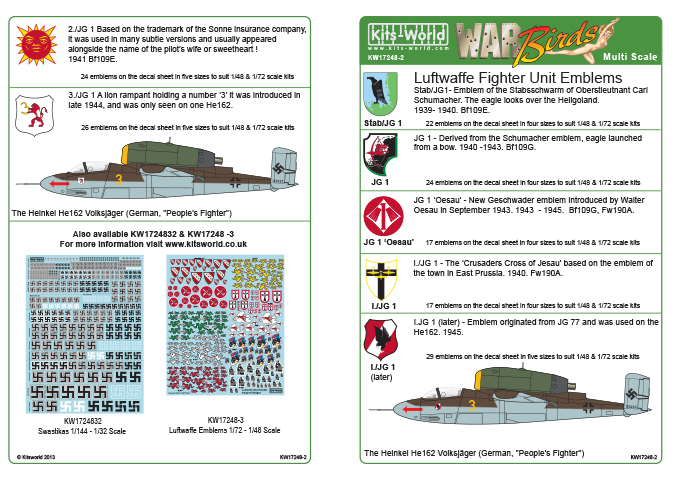 Stabskette JG1- used in autumn 1943, 'Kette' being the German term for chain/ formation of three aircraft. 1943. Fw 190A. 6./JG 1 - Yellow 'Tatzelwurm'.1942. Bf109F, Fw109A. III./JG 1 - The Maltese Cross introduced summer 1941 when the Geschwader reformed in Holland. 1941 - 1943. 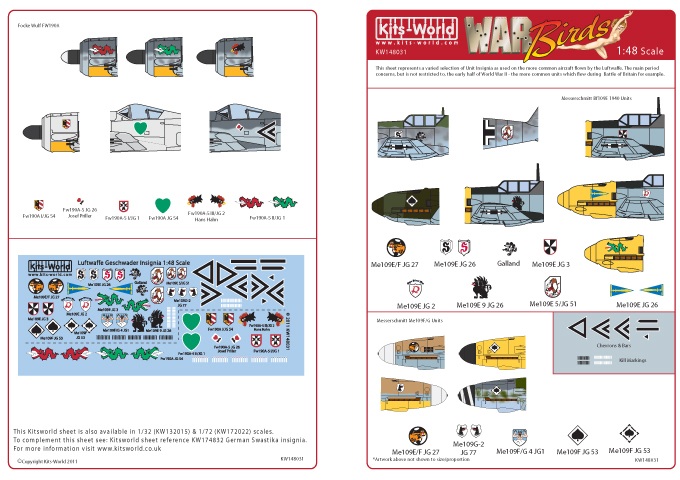 Bf109E/F, Fw190A. 2./JG 1 (early) - Typical early war insignia, depicting a sword cutting Chamberlain's umbrella in half. Autumn 1939. Bf109E. 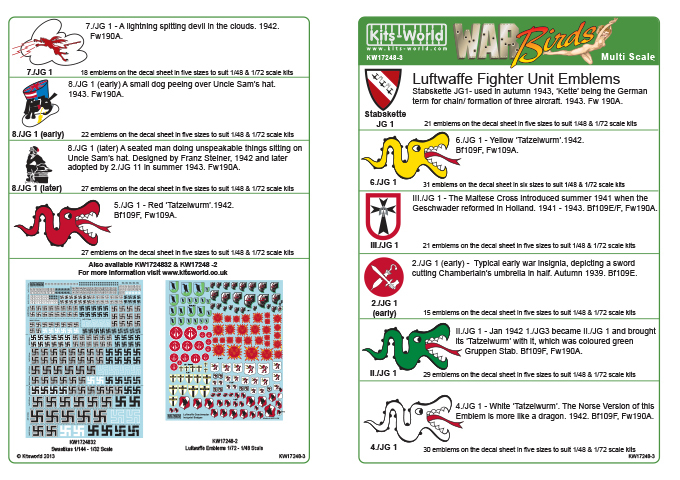 II./JG 1 - Jan 1942 1./JG3 became II./JG 1 and brought its 'Tatzelwurm' with it, which was coloured green Gruppen Stab. 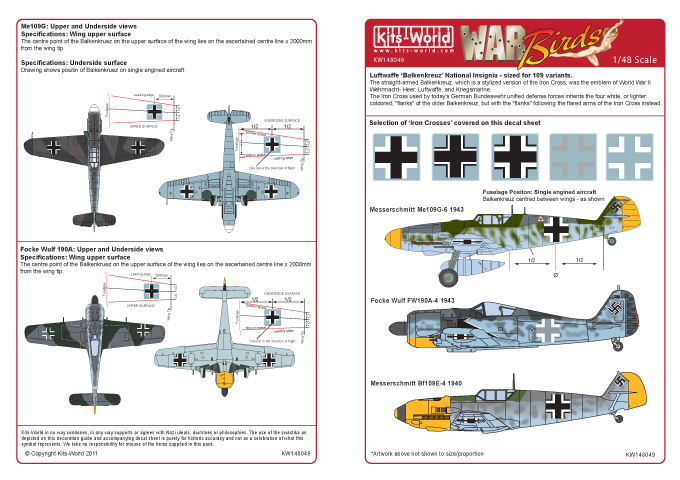 Bf109F, Fw190A. 7./JG 1 - A lightning spitting devil in the clouds. 1942. Fw190A. 8./JG 1 (early) - A small dog peeing over Uncle Sam's hat. 1943. Fw190A. 8./JG 1 (later) - A seated man doing unspeakable things sitting on Uncle Sam's hat. Designed by Franz Steiner, 1942 and later adopted by 2./JG 11 in summer 1943. Fw190A. 5./JG 1 - Red 'Tatzelwurm'.1942. 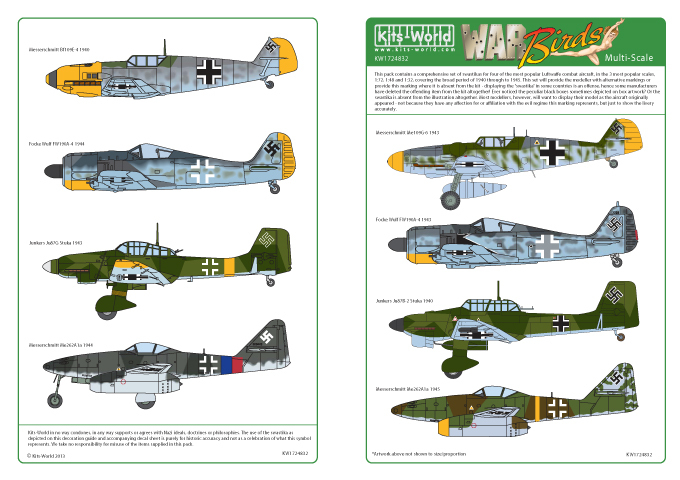 Bf109F, Fw109A. 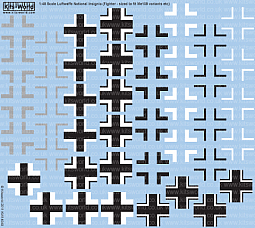 Luftwaffe 'Balkenkreuz' National Insignia - sized for 109 variants.The straight-armed Balkenkreuz, which is a stylized version of the Iron Cross, was the emblem of World War IIWehrmacht- Heer, Luftwaffe, and Kriegsmarine.The Iron Cross used by today's German Bundeswehr unified defense forces inherits the four white, or lighter coloured, "flanks" of the older Balkenkreuz, but with the "flanks" following the flared arms of the Iron Cross instead. 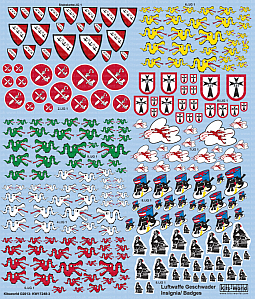 German Insignia in various scales.